I’ve been wanting to get to this recipe for ages – probably about 2 years – since I dined at PM24 in Melbourne, at the Wedding Reception of one of my friends. The meal was absolutely one to remember, the bride and groom were deliriously happy and it was a really, truly happy occasion. I was dismayed to read that PM24 is no longer – but will be relaunched as Lucy Liu’s Kitchen and Bar in the near future. The weather in Melbourne has been ridiculously hot – and even though one of the best things about cooking with a thermomix is that it doesn’t heat up the kitchen anywhere near as much as a stove does – so my cooking has taken a little break over the school holidays and the heat waves. We are all salmon fans in our house, so this recipe was one that I knew would be a crowd pleaser. It kept well for a few days in the fridge and was a lovely light summer meal when served with a green salad and some toasted baguette. It would also make a lovely light lunch – it will definitely be on my list of considerations for my next luncheon. Technically it’s listed in the book as an entree, which it would be great for, but my guess is that even divided among eight ramekins it would be too much for an individual entree. 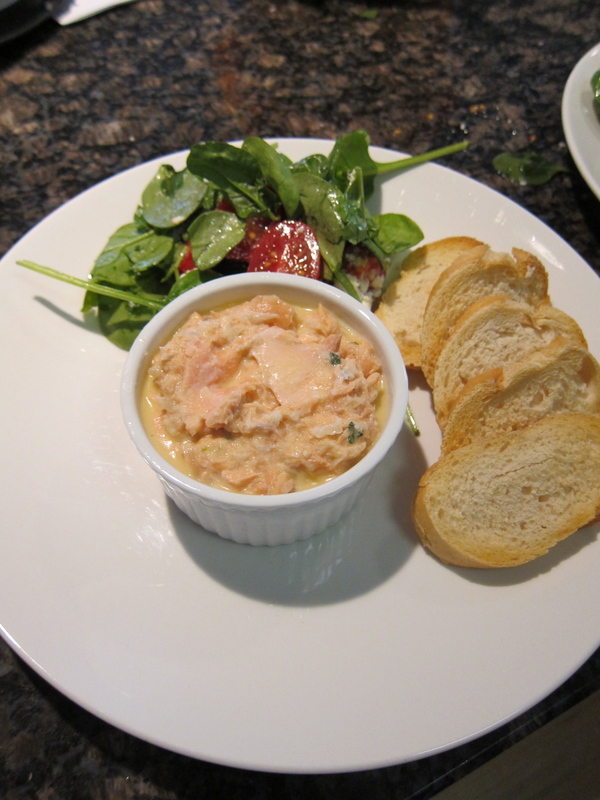 This would be a great recipe to use up left over smoked salmon (if indeed there is such a thing) – I should have thought of making this just after Christmas instead of waiting till the beginning of February. It’s dead easy to make and is super impressive and tasty. Make sure you leave yourself enough time to let it set if you are making it for a special occasion. I used several small ramekins when I transferred mine from the thermomix, covered them with glad wrap and put them in the fridge. If you have a second thermomix bowl then you can leave out the step where you cool the bowl with ice cubes and just use your second bowl instead. I must admit, I didn’t get my second bowl until about 12 months ago, after 3 years of Thermo-ownership. I never thought I’d use one and it does come in handy from time to time. If you can, choose salmon fillets that are an even size. They don’t need to look pretty as you’ll end up shredding them anyway. If I had my time again I probably would have been more vigilant when I chopped my smoked salmon, but it still tasted good! Make sure you use a good wine and vinegar as the flavours really penetrate the salmon. I used a lovely German Riesling and it was great. I could have done much better with my vinegar – I must get down to either Pure Italian, Leo’s, or Simon Johnson to get a really good one as I think mine let me down a little. Definitely use fresh dill. Wouldn’t you know – after being inundated with dill from my herb garden over the Christmas break, I had to go and buy some – arghhh! I’d probably use slightly more than 2 tablespoons as I’m a sucker for dill. I’m not sure what I keep doing wrong, but my clarified butter never turns out perfectly clear. Next time I’m going to try using a coffee filter instead of the clean, damp kitchen cloth and see if that gives me a better result. Mine didn’t look quite as broken up as the one in the picture in the book, probably because I was a bit uneven with the breaking up of the salmon into large pieces. I definitely had on my multitasking hat when I was making this – I had two people over and was talking to them at the same time I was making it – so it really is a doodle to make. I used a sourdough baguette and toasted it in the oven. It was delicious and gave me the chance to try my new oven out. I’ve never been a fan of grilling in the oven, but this worked perfectly and oh so evenly, so I’m now busily planning what my next dishes in the oven will be – I just have to wait for this spell of hot weather to pass! I served it with a salad of baby spinach, baby roma tomatoes and Persian fetta. Perfect! So – what was the verdict? A resounding yes!